Vietnam and the Philippines are growing closer together over Beijing’s claims and provocations. “To beef up military alliances targeted at a third party is not conducive to maintaining common security in the region,” Xi Jingping said at Shanghai’s CICA, a veiled reference to military alliances forming to stop China’s expansion in the South China Sea. But Vietnam and the Philippines were not listening; Vietnam’s Prime Minister Nguyen Tan Dung stated in Manila on Wednesday that both his country and the Philippines “are determined to oppose China’s violations,” with a view to strengthening diplomatic and defense ties to keep China at bay. With other diplomatic endeavors falling flat and China’s seemingly perpetual stranglehold over the Association of South East Asian Nations (ASEAN), Vietnam and the Philippines have few options left in curbing China’s expansion. However, considering China’s constant spats with many of its neighbors and endless claims to territory, this could be a novel way to combat China’s expansion. This strange show of diplomatic camaraderie against a common adversary is indeed rare, but, frankly, China has left them little choice. 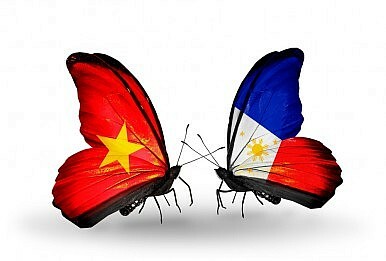 As The Diplomat pointed out yesterday, Vietnam and the Philippines can not look for help directly from the ASEAN, as some of the nations involved do not have pressing territorial problems with China, and the Middle Kingdom’s righteous indignation is a force to be feared indeed. But, despite claimant nations being shouted down at the ASEAN and passed over at CICA, they can still give Beijing headaches by working together. China, however, rejects this view, claiming that further cooperation between Southeast Asian nations to counter China’s claims would be harmful to regional security. Diplomatically, China has no trouble condemning, dismissing, and lambasting criticism on all sides by every nation in Southeast Asia, but accomplishments within the ASEAN sphere are not the only option for the many nations annoyed by China’s increased aggression. In the realm of public opinion — considering the only items China has in its diplomatic tool kit are a hammer and ear plugs — claimants can make ground and lose little by banding together on these disputes. Amid Xi’s warning at CICA — which was made in front of a number of claimant nations, including Vietnamese Vice President Nguyen Thi Doan and representatives from the Philippines and Japan — the Philippines and Vietnam have managed to become odd bedfellows in the diplomatic mêlée to keep China out of the South China Sea. If their gambit has a positive effect, others may want to follow suit. The Diplomat speaks with Dr. Patrick Cronin about the current tensions and the repercussions for China, Vietnam, and ASEAN. Vietnam to China: Move Your Oil Rig out of the South China SeaChina, Vietnam Pledge to Control Maritime Disputes China's Foreign Policy in 2014: A Year of 'Big Strokes'Xi Jinping Meets Vietnamese LeaderSo China Moved Its Oil Rig. What Now?